Here’s our interview with Ryan from DC Sharp, the only Japanese kitchen knife boutique in the Washington metropolitan area. 1. Hey Ryan, do you still remember the first knife that you sharpened? It was only back in September 2012 in my brothers basement in Washington DC. He had just started the sharpening business but happened to get a booth at a newly opened foodie market. 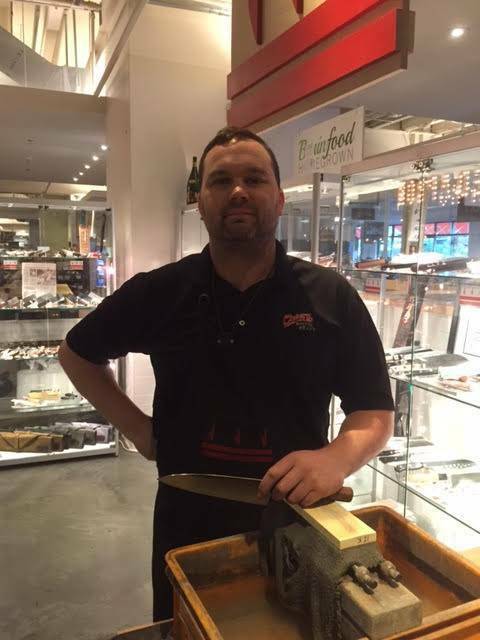 He suddenly had more customers knives than he could handle so he called me down from Boston to help for a week. I had just driven ten hours, walked down in his basement and he said, “ok, rub back in forth on these stones until sharp.” I got right to it since it seemed simple enough. Thirty minutes on my first knife and i was somewhat able to cut paper and i was thrilled. Those were the days where i can’t believe we made it. If it took me thirty minutes today i would be out of business. 2. What was the biggest challenge back then? Where do i begin? Because i started from scratch with no experience it was a combination of things. First it was not scratching the customers blades. Then it was learning to use both hands equally and maintaining an angle. Then it was maintaining a flat stone. I can still remember grinding an edge in a practical half pipe of a stone. All in all I would say there was nothing easy when I started but that’s what hard work and practice are for. 3. How long have you been sharpening knives for? As stated above, only since September of 2012. Since that time, i personally have sharpened just about 20,000 knives, all free hand sharpening. With repairs done on a Tormek grinding wheel or belt sander. 4. Tell us more about your sharpening technique. First off you must assess the knife as to not over sharpen. The goal in sharpening on stones is to remove the least amount of material as possible, at least from the primary edge. I equate it to sculpting. Somewhere below that dull steel is a sharp edge, you just have to bring it out. Most customers knives need secondary edge work so I will grind a secondary edge on a 220 grit stone, then polish the secondary and grind a primary on a 1000 grit, then repeat the process on a 4000 grit. I’ll often strop on an 8000 grit or higher as I prefer stropping on a higher grit stone in lieu of a leather strop. The most important aspect of sharpening in my option is thinning out the secondary edge. On western knives this will be done by way of a compound bevel, and on Japanese knives the pre ground secondary edge. 5. Is it a good idea to practice using inexpensive knives? I don’t think so. This will often lead to discouragement. I don’t mean go ahead and let your first knife be a custom Kramer or Carter, but at least start with knives you use. There’s something to be said about making it your own through the life of the knife. You develop a relationship with it. 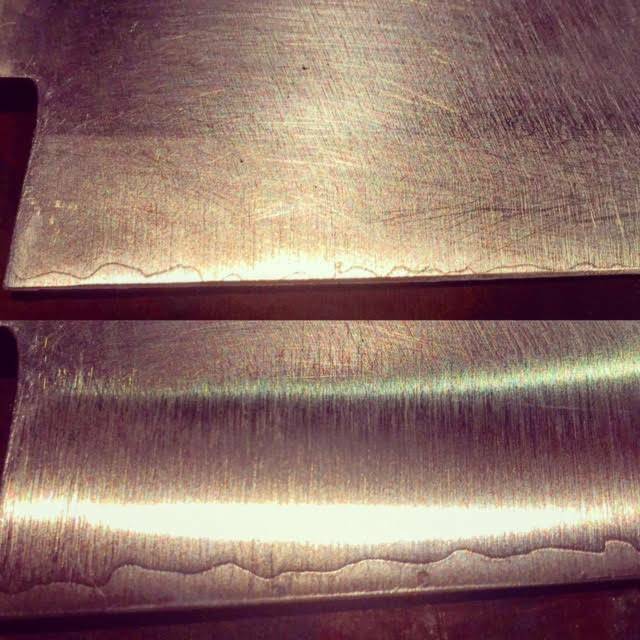 Cheap knives mean cheap steel so the results won’t be satisfying. Just remember you can never ruin a knife, but you can take a quality knife to absurd levels of sharpness. 6. What’s in your opinion the most common beginner mistake? Hands down it is not working the secondary edge. 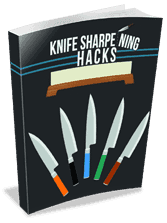 This is the key to sharpening. It is essential to maintain the original edge geometry and thinness of the blade. Once you have an adequately ground secondary edge, your primary edge is a piece of cake. Another big mistake is over grinding the primary edge. This will end up bringing you into the thicker part of the blade which renders all your efforts on the secondary edge fruitless. An improperly sharpened knife. The clad line on the edge is a tell tale sign. After proper thinning the clad line is well above the primary edge. 7. Are you still improving your sharpening process today? One should always try to be better. Im never satisfied. As of now I am taking a minimalist approach, realizing oftentimes a few strops on a 1000 grit stone will bring that edge right back. Especially with Aogami or Shirogami steels. As mentioned earlier the key is to remove as little metal as possible, I’m trying to see how far i can take that and still end up with a superb final product. 8. 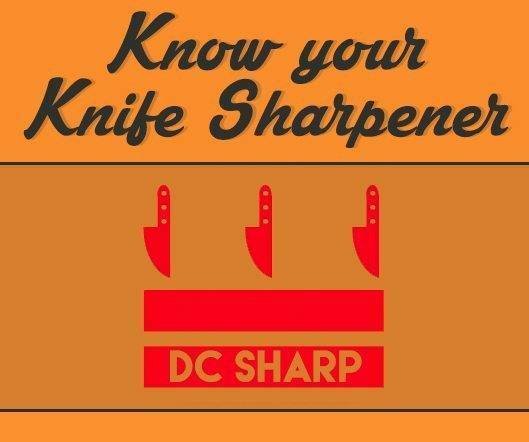 How do you test your knives for sharpness? While shaving arm hair is a very effective determination, i often times find myself running out of hair. The best way to tell is the “three finger test” of sharpness. I learned this by watching Murray Carter. For those not familiar, you are basically sliding your first three fingers along the edge of the blade, ever so carefully. Essentially slicing the skin on your fingertips. This is the best sense of a truly sharp blade, and also helps with assessing how much work a dull knife will need. You should see the look on customers faces when i do this in front of them. While the fingernail test or paper test will tell you it is sharp, there are different levels of sharpness. This method in my option is the ultimate determination. I literally have constant mini cuts on my fingertips. 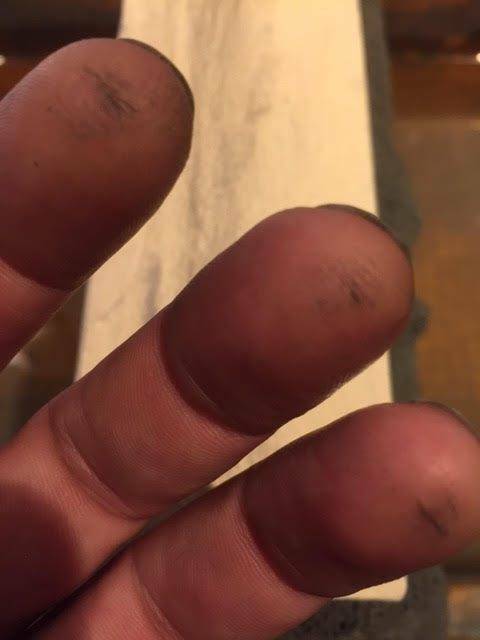 My fingers from testing sharpness. This is the question i get asked the most in my shop and to the surprise of most of the customers, i tell them not to worry about angles. Sure a knife comes out of the factory with a certain angle, but once it is dull you can put any angle you want on the blade, depending on what you plan to do with it. The important thing is maintaining the angle you decide to use Also, because we are not machines, there will always be a bit of convexity to your edge. The goal is to limit that convexity however and that comes with muscle memory. My rule of thumb is the better the steel, the lower the angle and hence sharper it will be. I will sharpen a german knife at a higher angle than say a VG-10 blade because the VG-10 can hold a finer angle. And I will sharpen Hitachi White #1 at a lower angle than VG-10. It is never good to limit oneself to rules and it’s always best to experiment. As I said, you can never truly ruin your knife. 10. Are there knives you don’t like to sharpen? We generally try not to accept any hollow ground Chinese chef knives, as they are made of the poorest materials and do not hold any edge whatsoever. Also the Damascus Calphalon’s are notorious for chipping and pitting in the edge. Folding knives made of S30-35VN are very difficult to get a good edge on but do provide a good challenge. And Ken Onion Shuns, that design is just so strange.